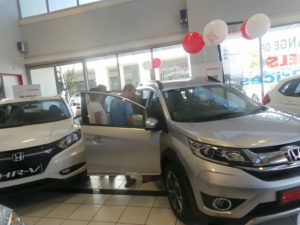 We are delighted to announce that we had a successful launch of the new Honda BR-V on the 22nd October. 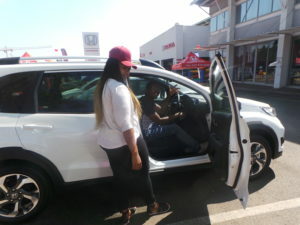 We provided our customers with the opportunity to experience the new BR-V.
Clients took turns to test drive the vehicle. In the vehicles we had water and sweets for the client as it was a nice hot day to keep them hydrated. Client had a feel of the vehicle as they drove for approximately 5 kilometres. Kids were entertained as well. 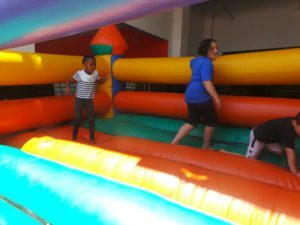 There was a jumping castle, food, refreshments, music and Skye dancer for our customers and the kids. 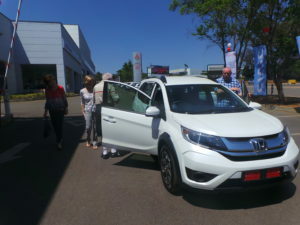 This is an amazing vehicle with lots of features, it’s spacious with good fuel economy. A real connection to the road. If you are looking for a car with a look that exudes a stylish SUV charter then look no further. There are driver and front passenger airbags. This spacious 7-seater was specifically designed with a host of safety features to give you and your family peace of mind on the road. It boasts both driver and passenger SRS airbags that will inflate immediately when heavy impact occurs. Not forgetting to mention WITH A GREAT ENGINE.